GoTalk Select - a wearable communication tool, part of "GoTalk Wear"
Availability: Info only. A release date is not expected until May 2019. Sorry folks! 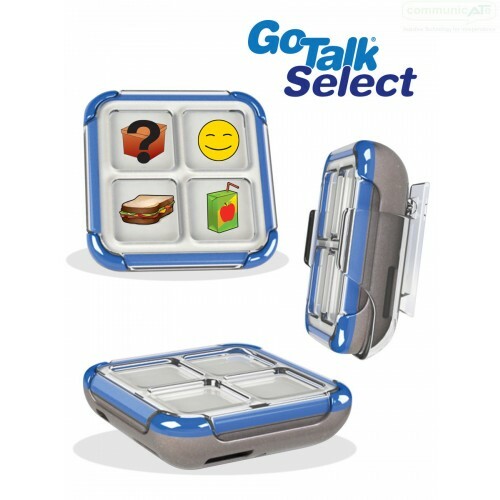 A small and rechargeable, 12 message, AAC device for convenient support throughout the day. Records and stores 12 messages in three levels, on four buttons. Attaches to lanyard or clip as a wearable communication device. Fits in a pocket for easy transport. Keep this all new, wearable, communicator with you using the clip or lanyard (both included) or just take it along in your pocket. 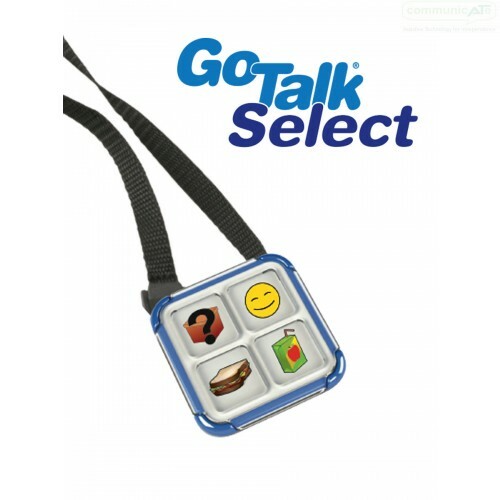 Small, light, and rechargeable via USB, the GoTalk Select offers four programmable message buttons on each of three levels for a total of 12 wearable quick messages! Program with 1, 2, 3, or 4 messages at a time, with each message button measuring at 2.75 cm x 2.75 cm. Powerful, high-quality speaker allows for remarkable volume from a small device. Also provides adjustable volume and a 2-year warranty!